Volkswagen Commercial Vehicles recently held its global annual adventure tour in the Sultanate of Oman, with more than 100 international journalists testing the power-full Amarok 4×4 pick-up in Oman’s diverse natural landscapes. During the six weeks event in March and April, Volkswagen (VW) introduced the new 190kW V6 Edition of the Amarok. 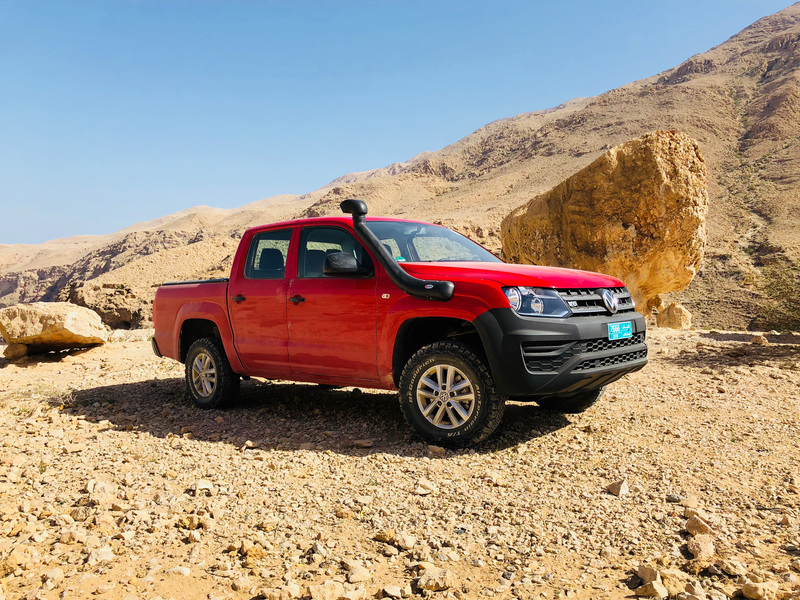 On invitation of VW, automotive journalists from around the world had the opportunity to test drive the new car for the first time on Oman’s highways, in coastal plains, on challenging off road mountain tracks, as well as in the sands of the desert. The major event has been prepared and overseen by Oman based companies Gulf Jewels Travel and Tours (GJTT) and INTEWO, in cooperation with the Berlin based agency familie redlich and Volkswagen Commercial Vehicles, Hannover, Germany. Oman’s Ministry of Tourism provided logistic support to the event. Divided into six groups, over a period of around 6 weeks, the journalists started their four days adventure tour at the new Muscat International Airport, heading towards Fins Beach with comfort on the modern highways. Before reaching Fins Beach for a lunch break, the group had the chance to learn about the nature conservation commitment of the Office for Conservation of the Environment (OCE), Diwan of Royal Court, with a short off-road drive through – and a visit to – the Ras Al Shajar Nature Reserve. Here flocks of Arabian Gazelles could be observed in their natural habitat. After a traditional lunch at the beach, which included fresh fish from the Sea of Oman, the squad continued the route to Bimmah Sinkhole, for a short stop at this scenic attraction. The next section of the journey became more challenging and adventures. From the coastal plains the track went uphill towards Salma Plateau. From sea level the cars had to climb up above 1.300 meters asl., using a harsh, dusty and twisting gravel track, which holds very steep tranches. But the Amarok managed this ambitious section with ease. Worth to mention that the landscape and views of this track are simply stunning and breathtaking. Once the plateau was reached, the next stop was scheduled at Majlis Al Jinn, one of the largest cave chambers in the world. The participants were interested to learn about the number of Boeing 747, which the cave could accommodate, or about Felix Baumgartner’s jump into the cave. The route followed the off-road tracks on the plateau, passing through a narrow and extremely scenic Wadi, which also shelters a historic village. Just before sunset the first day’s destination was reached at the Jaylah Tombs. Here – far from any civilization – it was time to set up the tents and to be prepared for the night, which should offer an unforgettable view to the starry sky. With being at 1.700 meters asl. now, one had to arrange himself with the freezing 13° degrees, in contrast to the 40° degrees in the plain area. Being well motivated after a rich outdoor breakfast, it was time to drive downhill on the western part of the mountain range. The „road“ was again challenging, and the landscape revealed its beautiful diversity. Rocks in the size of buildings, the transformation from yellowish limestone to greenish ophiolite, tens of millions of years difference in age, green, densely vegetated terraces, the Al Falalj irrigation system, historic villages – just to name a few attractions next to the track. The convoy continued through a Wadi, with high terraces of accumulated rocks and stones, huge faults and folding, and grazing camels. Another 30 minutes later, an asphalt road was reached, which leads the cars parallel to the mountain range. Next stop should be Wadi Bani Khalid, where it was time for a refreshing bath in the natural water pools and for a good lunch. But before reaching this key attraction, the group had to leave the main road again, for another off-road track, passing through another amazing landscape, with slopes, dried out river beds, soft hills and partly dense vegetation. All of this embedded in a fascinating geology, with unique folding and rock layers – truly qualifying to be listed as a UNESCO Geopark. From Wadi Bani Khalid it was time to leave the mountainous region towards the borders of the As Scharqiyya Sands desert. A short stop in Biddiyah, to refill the tanks of the Amarok and to release air from the tires, in order to be prepared for playing in the huge sandbox. Driving in the desert was a new, but exciting experience for many of the journalists. On sandy tracks and over up to 50 meters high sand dunes the way led to the luxury 1000 Nights Camp. Here, the opportunity to have a refreshing shower was mostly welcomed, as the temperature was already beyond the 40° degrees. The first hours of the third day were dominated by driving and crossing the desert, with challenging ups and downs in the dunes, where the one or the other rescue operation for a stucked Amarok had to take place. But these incidents have to be credited to the driver, and not to the car. The experienced Omani guides from GJTT managed to release any restrained cars with a smile. It was time to say good bye to the desert with its unique charm and outstanding landscape views. After refilling the tires, the way lead towards Muscat, but with a stopover in the small village of Zukait, Wilayat of Izki, where each group was hosted for a traditional Omani lunch. Delicious chicken and fresh fish with rice gave a good insight into Omani cuisine. Strengthened by this 5-star food, the final drive to Muscat was only a blink of an eye, before the day ended with a reception at the Grand Hyatt Muscat. The last morning was mainly dominated by sightseeing, with visiting the charming Mutrah Souq and the impressive Sultan Qaboos Grand Mosque. Finally, participants had to be ready for the farewell, before heading back to the airport with a heavy heart and a head full of great impressions. From coastal nature reserves, breathtaking mountainous off-road tracks to the endless sands of the desert – during the Amarok Adventure Tour 2018 in Oman the VW pick-up power pack provided a full insight into Oman’s natural wonders, enriched with Oman’s world-renowned hospitality. Truly a great advertising for the car and the destination Oman. Several articles and videos about the event have been published. Here is a link to the official video (german language), published by Volkswagen.